Faculty Grants are designed to provide support for individuals or groups with reasonable expenditures associated with research, scholarly activity or creative projects in the field of animation. Expenditures must occur for the year running from 2017 to 2018. 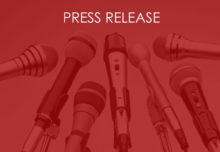 Awards will range from US$1,000 to a maximum of US$5,000 per applicant. 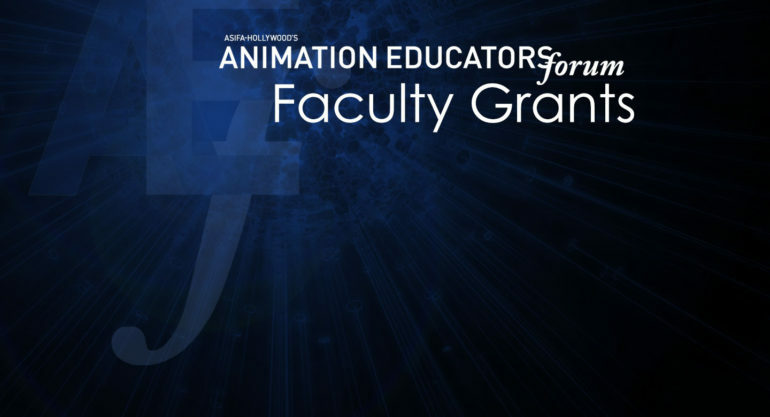 All ASIFA-Hollywood’s Animation Educators Forum members are eligible for Faculty Grants. To become an AEF member, simply send an email to info@animationeducatorsforum.org to request membership. There is no cost to become a member but please include your Resume or BIO as proof of your full time or adjunct faculty status. Applicants must have full time or adjunct faculty status at an accredited post-secondary institution. To be considered for the grant, adjunct faculty need to be teaching a minimum of two (2) courses per year at accredited post-secondary colleges or universities (note: the two (2) courses may be taught at different institutions). It is most likely that only one (1) applicant at a single institution will be awarded in a grant year. This limitation is based in the intent of ASIFA-Hollywood’s Animation Educators Forum to assist faculty across a wide geographic and academic range. Contributions to the animation community at large. Applications for the ASIFA-Hollywood’s Animation Educators Forum Faculty Grant will only be considered if fully complete and received by Feb 6, 2017 11:59pm. 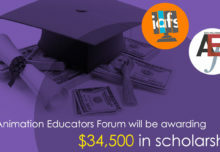 To apply, go to: http://grants.animationeducatorsforum.org and attach your proposal and supporting documents outlined below. Please name your files with the following title: 2017_AEFGrantApplication_LastnameFirstname.pdf (example: 2017_AEFGrantApplication_DoeJohn.pdf). To be considered for the ASIFA-Hollywood’s Animation Educators Faculty Grant, a written proposal describing the scope of the research, scholarship activity or creative project must be submitted. We ask that the text of the proposal be prepared using twelve (12) point type and one (1) inch margins and is not to exceed two (2) pages in length. In addition, please include a cover page with the name of the applicant, name of the institution(s) where the applicant is a faculty member, the grant year being applied for and a brief (single sentence) title/summary of the research, scholarly activity or creative project. Please use the headings in bold type below in organizing the content of the Proposal. Description of the research, scholarly activity or creative project. Background and significance of the research, scholarly activity or creative project. Summarize the inspiration/motivation for the project, including work previously completed on it. Indicate whether the project breaks new ground and/or is part of an on-going activity. Describe the nature of its contribution to the field of animation. Design/methodology of research or components of creative project to be undertaken. List and describe the specific activities in which you will engage in. Include timeline and feasibility of project within the timeline. Anticipated outcomes and goals of the activity. Outcomes may include the completion and screening of a finished film, presentation of a paper at a conference, persuasive proposals to external agencies etc. Goals may include finishing part of an ongoing project (e.g., progress towards completing a book or film). This should include a date that the project will be considered complete, and will determine the submission deadline for a Final Report (details to follow). Please include a heading of Estimated Budget in your application document. The contents of this section will vary based on the nature of your proposal; applicants may include components that have not been suggested below. All items that have been included in the proposed budget should have a corresponding entry in the final report to be submitted at the conclusion of the project/activity. note: In calculating travel expenses, we recommend using per diem rates found at the U.S. General Service Administration Per Diem Rates website in the continental United States. Script, storyboard or other pre-production materials related to a creative project (ex. 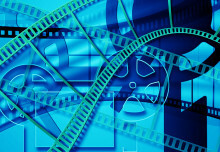 film or installation) that may assist the Selection Committee in evaluating its potential. Upon acceptance of the ASIFA-Hollywood’s Animation Educators Faculty Grant, the following conditions must be agreed to. A more detailed document will be provided to the individuals who have been chosen to receive the Grant, and may or may not include more specific/additional responsibilities. Individuals who receive grants are responsible for the completion of their proposed activities whether they are fully or only partially funded by the grant. If there is any substantial change, for whatever reason, to the project between the time of the award announcement and the time the activity is completed, the awardee must immediately notify the Faculty Grant Selection Committee. If the awardee wishes to continue using the grant (or what remains of it), they must submit a revised proposal and budget. The Committee will decide if the revised activity and budget is a reasonable substitute for the original. If the proposal is deemed inappropriate the remaining funds will need to be returned the Faculty Grant Fund. If the awardee is unable to either begin or complete the project, then the unused funds must be returned to the Faculty Grant Fund. Individuals who receive Faculty Grants must present the results of the proposed activity or project to the Selection Committee upon its completion in a Final Report. 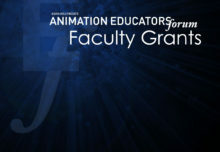 Grant recipients must acknowledge that funding was provided by ASIFA-Hollywood through the Animation Educators Forum. This applies to each time that the work is published or presented. Examples that would fulfill this requirement include an acknowledgement in an introduction to a book, or the inclusion of the logo/credit line in a film.